In the Kinta Lodge, members frequently made donations to other lodges around the region. 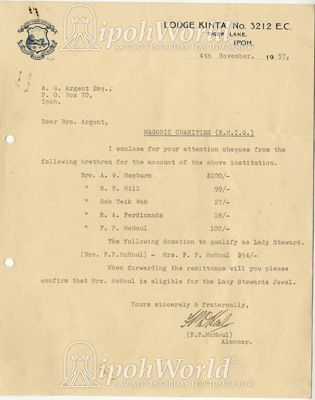 As shown in the pictures above, the members forked out a bit of their own money to be donated to places such as the Royal Masonic Institution for Girls (R.M.I.G), Royal Masonic Institution for Boys (R.M.I.B), Royal Masonic Benevolent Institute (R.M.N.I) , Royal Masonic Hospital and the District Grand Lodge Benevolent Fund (D.G.L.B.F). The donations range from 5 Guineas (A British Coin) to as much as 100 dollars. Among the donors are Sharma, a lawyer and Hepburn, a miner. We thank Ipoh Remembered for the details.